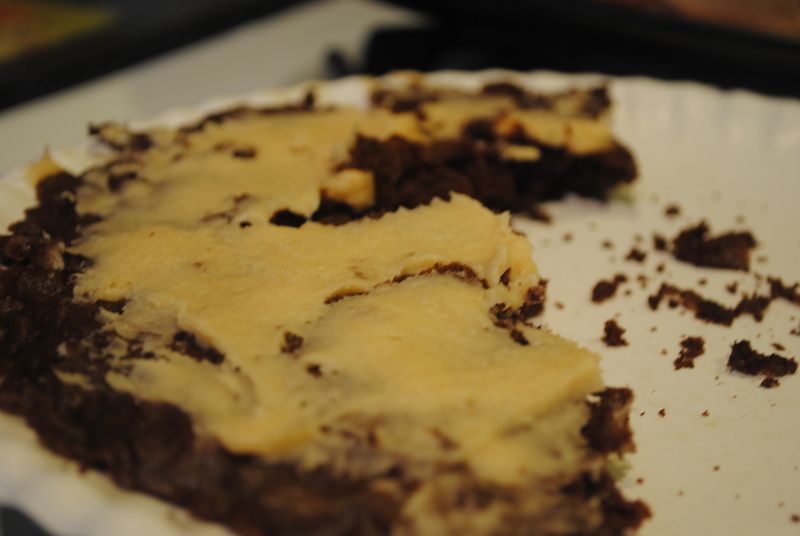 This deliciously decadent cake is a family recipe from my parents’ restaurant when I was little. I can remember one of my many little jobs as a child at the restaurant was cutting up the Reese cups for this cake EVERY DAY! They sold almost an entire cake everyday at the restaurant and the piece or two leftover was always being fought over by the employees. We were like vultures with this cake. The last piece came into the kitchen and we flocked to it and dug our claws in. Looking back I think of us as animals clawing through the cake, shoving each other out of the way…Obviously, that’s not exactly how it happened. I picture the scene in Mean Girls when she flies over the table and attacks the girl, that was us, with this cake. Yeah, it’s really that good. I don’t even like chocolate OR peanut butter! So for my niece’s birthday and my brother in-law’s birthday we had a little get together tonight at my in-law’s house. I was in charge of dessert, so I made the cake. 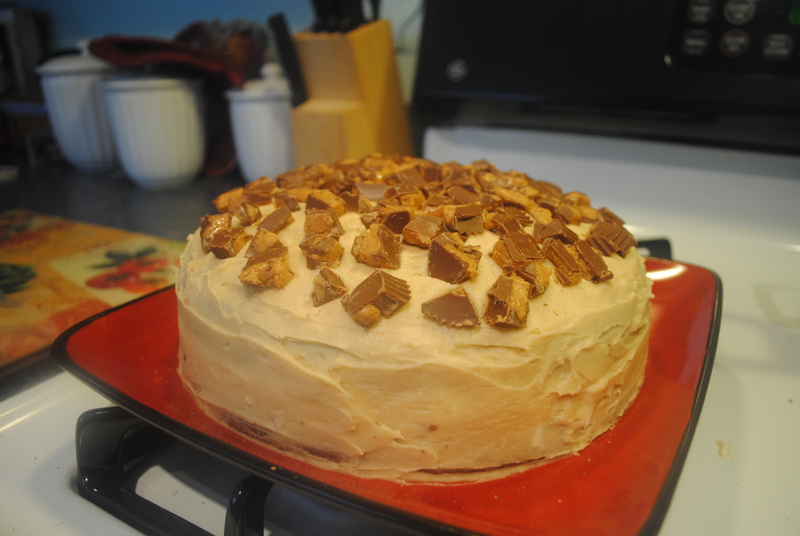 I chose this, because every single birthday, no matter whose it is, we have chocolate cake with peanut butter frosting. It’s Andrew’s whole family’s favorite cake. I figured this would be perfect! You can also find this recipe on my mom’s blog, at this link. I haven’t changed the recipe at all because it’s so perfect the way it originally was. Here it is! Enjoy! Bake according to box directions in two 9inch pans. Cut top off of one cake once finished, set aside for cooling. Beat peanut butter and butter together until smooth. Slowly add in confectioners sugar and beat in cream cheese and cream until desired consistency. Frost top of cut top cake almost to edges. Place second cake layer on top. 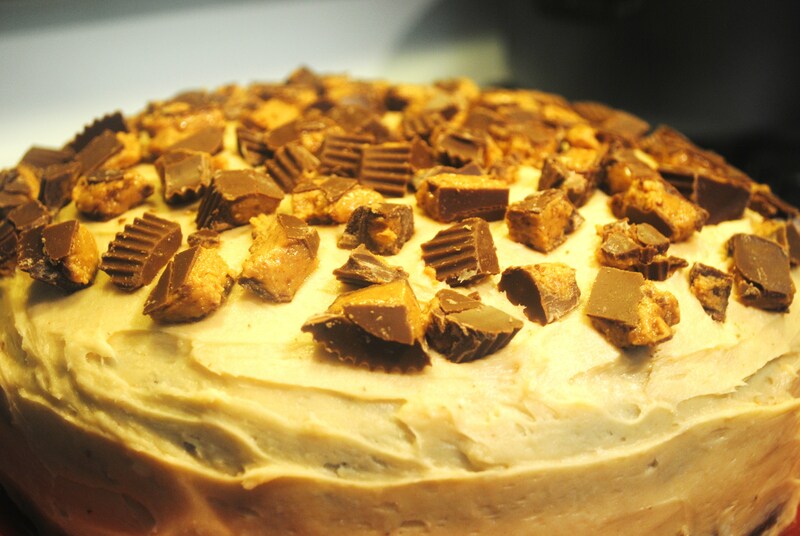 Frost entire cake and sprinkle Reese Cups on top. Drizzle chocolate syrup over top if desired. And the scraps were good too! I just couldn’t wait to I saved a little frosting and got my fill before dinner!